View More In Waste Bins. * Had enough back-breaking work? Innovative venting channels reduce the lifting force needed to empty receptacle by up to 60%. Molded-in holes and cinch points hold liners in place, eliminating the need for tying knots. Ergonomically designed with built-in side handles and base grips. Handles a high volume of waste within a small footprint, making this the perfect waste receptacle when space is at a premium. Lid sold separately. 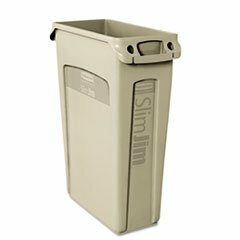 Waste Receptacle Type: Wastebaskets; Material(s): Plastic; Application: General Waste.